In order to push the MUDRA Yojana, the finance ministry has assigned the banks, a responsibility of lending total 1.22 lakh crore rupees to micro, small and medium business units, by March 2016. The banks have already disbursed a loan amount of 20,000 crores by the end of the September 2015 under the Mudra Scheme. This implies that there is still 1 lakh crore rupees that are available for the small business units in the next six months. As per the Finance Ministry of India, there have been a lot of efforts from the banks to ensure the increased awareness and popularity of Mudra Scheme. Banks are also organizing awareness camps throughout the country. A Credit Suisse report said that if this target is achieved there will be a huge increase in the loan demands from the MFIs and NBFCs. However, given that only 20,000 crores of the targeted 1.22 lakh crores is disbursed in the first six months of the fiscal year, and the demand for loan is subdued, there are concerns about achieving such an ambitious target by Mudra. MUDRA Yojana was announced by the PM Narendra Modi in the month of April this year, with an objective to provide loans to the unorganized sector of the country. Mudra Bank was established as refinancing bank, which apart from financing the MFIs, will also act as a regulator for the refinancing industry. 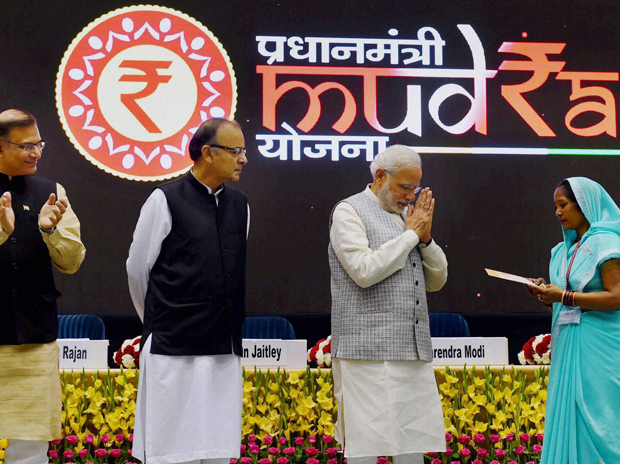 MUDRA Yojana offers loans to Shishu, Kishore and Tarun companies up to Rs 50,000, 5 lakhs and 10 lakhs respectively. Apart from the slower rate at which credit is growing currently, the lack of any suitable product under the Mudra scheme is a big impediment to the lending target. However, an official asserts that even if the current target is not met, the growth will be significant next year. The Credit Suisse report also states that although, there are risks in target based lending, the Mudra bank can achieve the target, since larger banks do not have the ability to disburse small ticket loans. As such, there will be an increased demand for the loans of microfinance institutions, even from the banks which have to achieve the targets set for Mudra loan. The report also suggests that apart from the increased demand in lending, there will also be growth in the consumption. As per the target, the public banks have to lend Rs 70,000 crores, while private bank and Regional Rural Banks have to lend Rs 30,000 crores and Rs 22,000 crores, respectively.